Description: Get a grip on this compact knife featuring a satin finished, hollow ground modified sheepsfoot blade. A modified sheepsfoot shape makes it very useful. 154CM stainless steel assures a keen, long lasting edge that will easily slice through food, ropes, and more, while the lightweight construction means it won't take a lot of effort to do it. 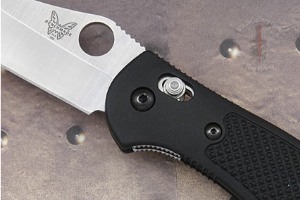 The round thumb-hole opener makes the knife easy to open with one or two hands. 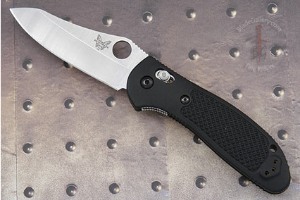 The ambidextrous blade is locked with Benchmade's AXIS locking mechanism and is unmatched for function and strength. The black glass fill Noryl GTX handle is lightweight and easy to grip. Reversible pocket clip makes storage and carry easy--just clip it on your pocket or belt and go! 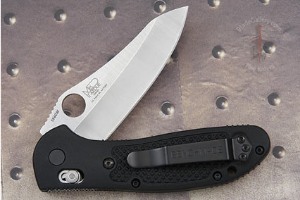 If you don't plan on chopping wood with it, this knife is one of the best. 0.09423828125 0.0322265625 94.23828125 32.2265625 Trailer Started. 0.18701171875 0.0927734375 187.01171875 92.7734375 Trailer Completed.